I had noticed there was no beach at Sandy Lake Beach Park during earlier visits in June and July of 2018 and wondered how long it would take for the lake to drop to the level I had seen in the summer of 2017. 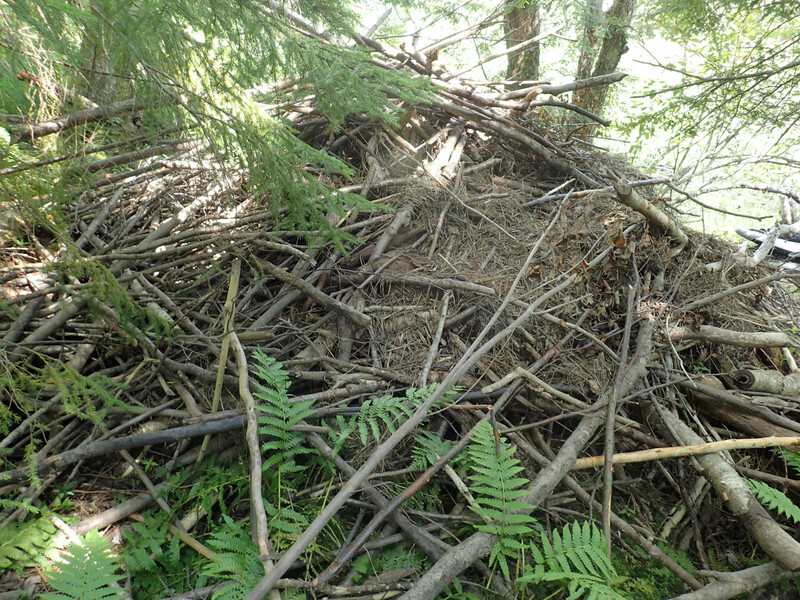 Lake resident Bruce S. told me why it hasn’t dropped: beavers had been building dams on Upper Perverill’s Brook. I was pretty anxious to have a look. 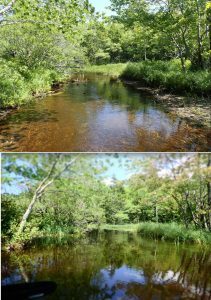 With Derek S., I had made a trek down Upper Peverill’s Brook on Aug 15, 2017. We were then able to take my good ship Lollipop (an inflatable Sea Eagle FastTrack kayak) only into the upper reaches of the brook for a distance of about 160 m from the entrance on Sandy Lake, and that with some grounding. On Aug 3, 2018 we repeated the route, but this time it could be paddled with ease for about 360 m into the brook except for having to lift the kayak across three dams on the way. At approx 360 m in, the water was about waist depth at a 4th, final (we think) dam, and it drops several feet into ankle deep water below this 4th damn. The first 2 dams seemed to be in early stages, the third was larger but was not holding much water back, perhaps 10 cm. Photos from Aug 15, 2017 illustrate that this 4th dam was partially constructed at that time, but was not holding much water back. 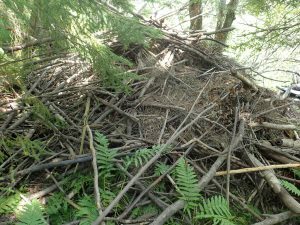 Also new in 2018: a large beaver lodge has been constructed about 5 m upstream from the first dam. 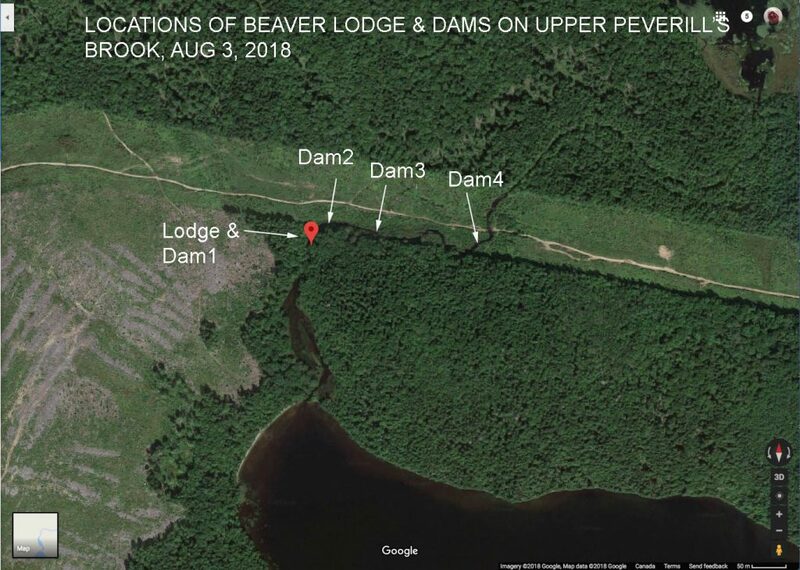 Derek S. told me that in the summer of 2018 he has observed two or three beavers passing his cottage on the western shore of Sandy Lake each morning at about 7:30 am going towards the top (south end) of the lake and returning in the evening. So stuff”s goin’ on. Beaver lodges and other activities have been noted near the inlet at the south end of Sandy Lake in the recent to more distant past but not, I understand, on Upper Peverill’s Brook. 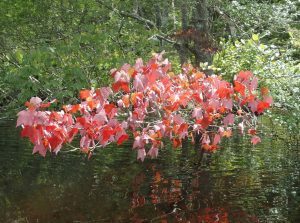 On Aug 3, 2018 we noted some striking early senescence (dying) of red maple leaves in some of the newly flooded areas (the leaves had already turned the crimson red you see in late Sept/early Oct), also of new, terminal growth on balsam fir branches at one flooded site. 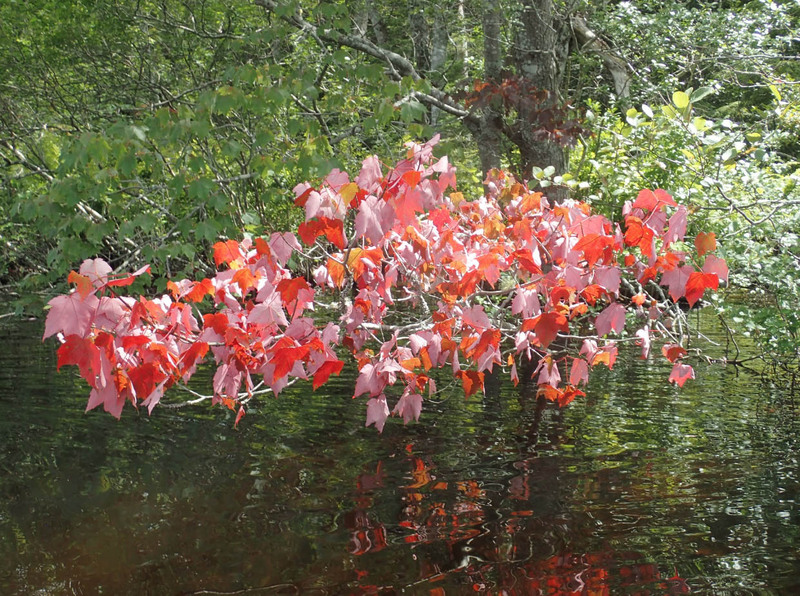 The early senescence was likely a result of reduced aeration of roots of the affected trees associated with the higher water levels. 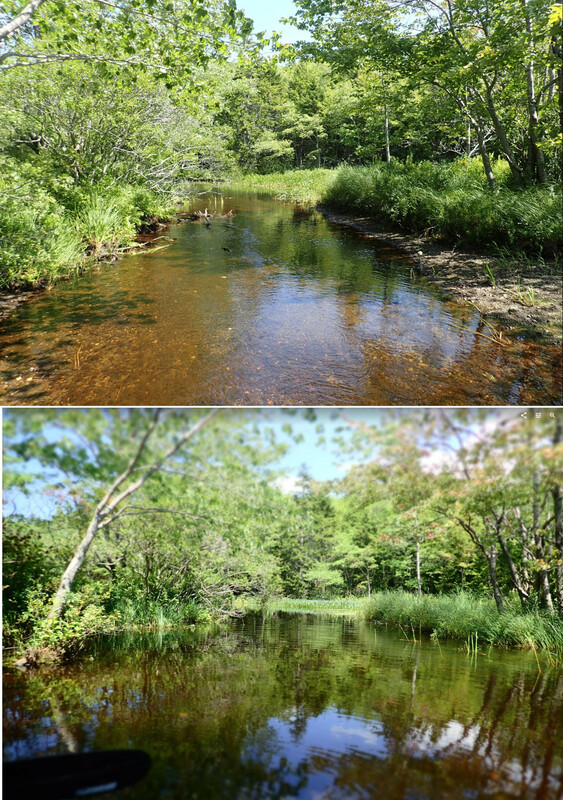 ‘Don’t know if the beaver activity is a “good” thing or a “bad” thing for the Sandy Lake to Sackville River watercourse and its many inhabitants. It is a natural thing and the system will adjust. These albums, posted on Google Photos, provide some of the observations on which the various descriptions on this website are based. You can start at the beginning of an album and go through it quite quickly, pausing as you might wish, e.g. to enlarge a photo for closer examination. Click on the i-icon at the top right of the first photo to bring up descriptions and Google map locations of the photos.